Dr. Moschos A. Papadopoulos is Professor, Chairman and Program Director at the Department of Orthodontics, School of Dentistry, Aristotle University of Thessaloniki, Greece. He is also President of the Balkan Association of Orthodontic Specialists and of the Orthodontic Society of Northern Greece, Honorary Editor of the “Hellenic Orthodontic Review”, and served as Asst. Editor of the “World Journal of Orthodontics” and as Assoc. Editor of “Stoma”. He also is/or served as Member of the Editorial Board of 19 peer reviewed journals, and as Referee of 40 orthodontic, dental and medical journals. He is an active member in more than 20 national and international societies, federations, and unions. Dr. M. A. Papadopoulos received several awards and distinctions, among others the “A. Tsoukanelis Award” from the Aristotle University of Thessaloniki, the “Annual Scientific Award” from the German Association of Plastic Surgeons, the “Joseph E. Johnson Clinical Award” and the “Turpin Award for Evidence-Based Research” from the American Association of Orthodontists, the “Align Research Award” from Align Technology Inc. USA, the “Ioannis Margelos Research Scholarship” from the Hellenic Society of Endodontics, the “Best Poster Presentation Award” and the “Best Publication Award” from the Orthodontic Society of Northern Greece. Currently the main clinical and research interests of Dr. M. A. Papadopoulos include the subjects of “noncompliance orthodontic treatment”, “use of miniscrew implants as temporary anchorage devices in orthodontic treatment”, and “evidence based orthodontics”. Dr. M. A. Papadopoulos has written the books entitled “Orthodontic treatment for the Class II non-compliant patient: Current principles and techniques”, “Skeletal anchorage in orthodontic treatment of Class II malocclusion”, and “Cleft lip and palate: Diagnosis and treatment management”, has published more than 200 scientific publications, and has presented more than 330 lectures, courses and papers worldwide. Professor Jonathan Sandler has been a Consultant Orthodontist at Chesterfield Royal Hospital for nearly 25 years and has taken a perticular interest in the teaching of orthodontics at all levels. He is the President of the Angle Society of Europe and President of the British Orthodontic Society. He examined for the M.Orth for 11 years and has been a European Board of Orthodontics examiner for the past 5 years. He has lectured extensively internationally for the past quarter century and has authored and co-authored over 120 papers. 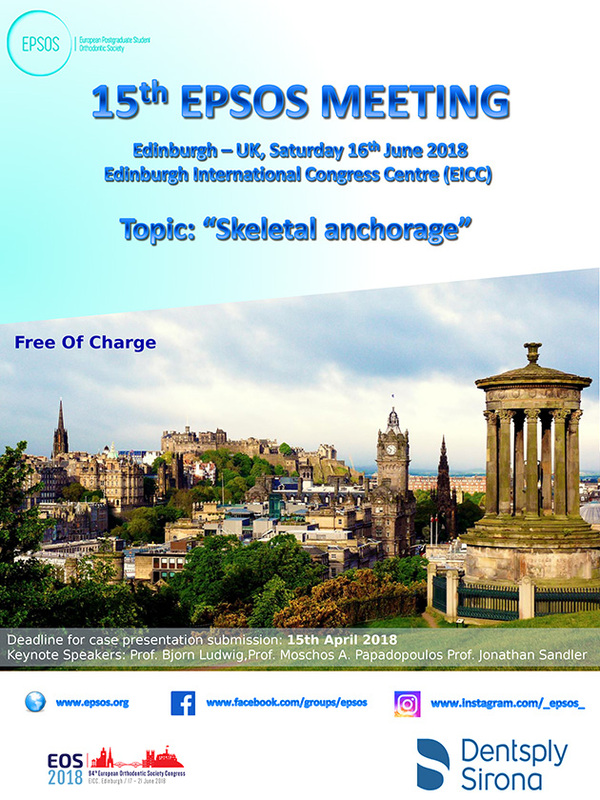 The topic of the EPSOS meeting in Edinburgh 16th of June 2018 will be “Skeletal Anchorage”. No restrictions are set on the type of treatment to be presented however, the presenting author must be a member of the EPSOS (currently postgraduate student in orthodontics). We are pleased to announce the establishment of a new award program sponsored by Dentsply Sirona Orthodontics as part of the GCARE initiative, the GAC Clinical Alliance for Research and Education. The award is designed to promote and recognize excellence in clinical or translational research completed by orthodontic residents during the 2017/2018 year. Award winner will be recognized in June 2018 at the XV EPSOS meeting in Edinburgh, Soctland. During the XV EPSOS Meeting the new EPSOS Vice-President (2019-2021) and the new EPSOS Treasurer (2019-2020) will be elected. Official registration to join the XV EPSOS Meeting in Edinburgh is closed but you can contact epsosmail@gmail.com!